Jeanne Gang has designed three new towers to replace Pierce, at heights of five, 11, and 15 stories; the designs remain faithful to the house system by incorporating triple-height spaces called "hubs." 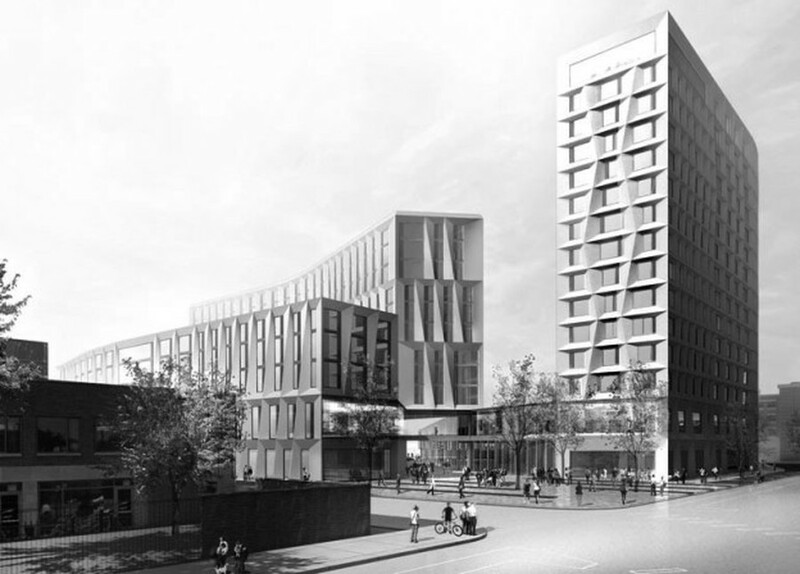 In July, Chicago-based architecture firm Studio Gang Architects unveiled renderings for its latest project, a new dormitory at the University of Chicago to replace Pierce Tower. The design is smart and thoughtful, responsive to both the needs of the student residents and to the local context of the University and the Hyde Park neighborhood. Since its founding in 1997 by principal architect Jeanne Gang, Studio Gang Architects has produced significant theoretical and built works. The firm is known for its sensitivity to the cultural and historical context of its projects, as it demonstrated with Hyderabad 02 in India and the Solar Carve Tower in New York City, currently under construction. Gang’s keen understanding of the structural and aesthetic potential of materials is evidenced in the Aqua Tower downtown, the Arcus Center at Kalamazoo College, and the Nature Boardwalk at the Lincoln Park Zoo. The dormitory design features three tall buildings—five, 11, and 15 stories tall—with public and semi-public spaces on the ground floor and dormitory rooms and student common spaces above. The buildings are situated within a mixture of public and private park spaces that Gang has envisioned as an extension of the green spaces of the existing campus. Gang’s design translates the social organization of the University’s house system into architectural form by imagining the core of each house as a literal three-story house. The three-story module derived from the suburban house becomes the social nucleus of each residential house. Each individual finished building—a complex of houses—results from a series of spatial operations on this center. First, dormitory rooms are added to both sides of the nucleus, extending the house into a long horizontal block; the buildings then rise up from the ground as an (almost) vertical stack of blocks. In Gang’s design, houses are stacked with a slight horizontal offset, rather than straight up. This offset of each house from its neighbors above and below embodies the differences between houses and their relationship to each other within the house system. Other contemporary architecture firms, such as Herzog & de Meuron and SANAA, have explored the possibilities of irregularities in stacking floor plates. Gang’s design distinguishes itself from these projects by the disciplined logic of her application. Where Herzog & de Meuron and SANAA’s projects tend toward the arbitrary, Gang’s offset creates order. Horizontal and vertical elements play tag-team, here connecting, there dividing, always reinforcing social organization. Each house is primarily horizontal. To balance this, Gang locates the vertical circulation for each house within a triple-height “house hub” at the center of each house that is meant to serve as the dominant social space. On the outside, the facades of the two buildings located along University Avenue express elegantly the spatial organization within. Dorm room windows are tall, the glazing reaching continuously up the height of each house. Viewed together, the windows form a regular cartesian grid. Tracing the edges of the masonry framing the windows exposes a field of diagonals stretching the full height of each building. These diagonals proclaim the unity of the dorm as a whole. It is perhaps here, on the facade, that Gang manages to best capture the complex part-to-whole relationships between student, house, and dormitory. Although it’s clear that Gang has attempted to organize the third and tallest building, situated along 55th Street, according to the same principles, compromises in the arrangement of the houses leave the facade graceless and opaque. Houses are staggered about a central vertical axis rather than along a diagonal. The resulting zig-zag pattern lacks the sense of resolution and integrity of the diagonal of the other two buildings. More seriously, the heavy spandrels marking every floor plate—rather than every third—obscure the organization of the building into houses. The resulting façade is neither appealing nor descriptive. The void between the three buildings generates another powerful diagonal connecting the proposed plaza at East 55th Street and South University Avenue to the Smart Museum, one block over. Gang has promoted this diagonal pathway as a connective thoroughfare uniting the new complex of buildings north of East 56th Street to the older quads to the south. Yet upon reaching East 56th Street this vector runs straight into a four-story building: the Max Palevsky Residential Commons. In order to continue to the main campus, pedestrians must retrace their steps east to find an aperture between Max Palevsky East and Central that serves as a back entrance to Bartlett quad. This zig-zag makes the diagonal a poor connection to the central campus. Instead, the strength of this diagonal is its east-west link, uniting the new dormitory complex with the Smart Museum, Court Theatre, and, on the other side of East 56th Street, Ratner Athletics Center. Gang’s pathway will create an integrated quad that will serve as an anchor on the north end of campus. On the whole, Studio Gang Architects’ designs are a sensitive response to the social organization of the dormitory system and to the location. Architecture lovers should keep their fingers crossed that, as the building process enters its next phase, the building itself will stay true to the best parts of this design, becoming a structure that is elegant on the outside and mindful of those within. Justin Manley writes about architecture at outoftheyards.com and tweets at @outoftheyards.